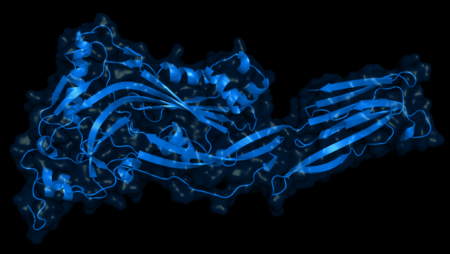 Listeriolysin O (LLO) is a pore-forming protein from Listeria monocytogenes which belong to hemolysin family. The toxin may be considered a virulence factor, since because of its pivotal role for the virulence of L. monocytogenes. Listeriolysin O is a thiol-activated cholesterol-dependent pore forming toxin protein - it is activated by reducing agents and inhibited by oxidizing agents. However, LLO differs from other thiol-activated toxins, since its cytolytic activity is maximized at a pH of 5.5, which occur in the phagosome It cause that LLO is selectively activated within the acidic phagosomes of cells that have phagocytosed L. monocytogenes. After LLO lyses the phagosome, the bacterium escapes into the cytosol, where it can grow intracellularly. Upon release from the phagosome, activity of the protein is reduced due to more basic environment. Aforementioned mechanism permit bacteria to escape from phagosomes into the cytosol without damaging the plasma membrane of the infected cell. This allows the bacteria to live intracellularly, where they are protected from extracellular immune system factors such as the complement system and antibodies. A PEST-like sequence is present in LLO and is considered essential for virulence, since mutants lacking the sequence lysed the host cell. Due to involvement of listeriolysin in pathogenicity of Listeria monocytogenes and as it can be possible that bacteria expressing just listeriolysin may be able to invade eucaryotic cells (although literature data suggest that it requires other proteins like invasin or internalin), special safety measures should be taken in account, especially when working with bacteria transformed with this part. It includes obligatory use of laboratory gloves, and avoidance of any contact with transformed bacteria. All waste contaminated with bacteria expressing listeriolysin should be autoclaved. DNA containing listeriolysin should be also well protected because accidental transfer to other bacteria may lead to rise of potentially pathogenic organism.